A new series and a new beginning…Bull run to continue ?! 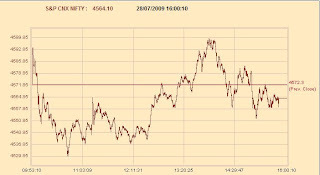 After the remarkable July series, it is time to look fresh at the markets for the next series. Bulls having won considerably in the July series, looks like will be taking the upperhand for the initial few days and should push Nifty to year high and above. As mentioned earlier, 4965 is the maximum level that I am currently looking at and this needs to be reviewed as the series progresses. Again most of the time Nifty was hovering around 4444 levels and that, followed by 4380 are the key levels to watch out for. 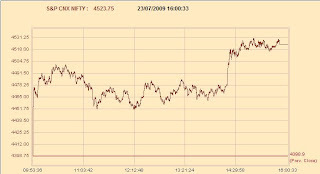 Bulls to regain control for the expiry !! 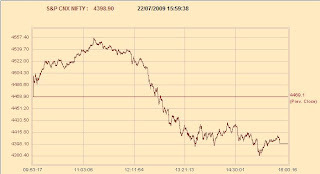 Bears had a good day yesterday and it looked like bulls were all too tired to push Nifty up further for the expiry. But overall, bulls still seem to have a strong control for this expiry and the likely level of expiry is around 4560 or higher. 4527 has been established as a strong resistance and Nifty is unlikely to move up that level in the morning session and similarly 4474 level is a good support and Nifty is unlikely to fall below that also. So it does look like Nifty will be hovering between 4474 and 4527 before bulls take control and charge it for a higher close. View remains intact..Nifty to test further highs ?! 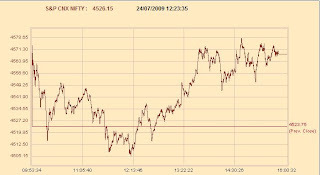 Another doji yesterday and the general view has been created as to Nifty is struggling to move past 4600 levels. Overall the pattern still remains extremely bullish and can push Nifty all the way to test 4700 levels. In case if the expected up move doesnt happen today, then also it looks like there will be a strong up move tomorrow for the expiry. The expiry strike will be more or less clear at the end of the day today. A rest day and bull run to continue ?! 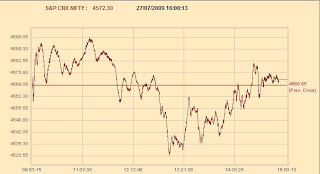 Yesterday market made a new high for the july month series and formed a doji at the top. It looks like a pause before the next significant move and there are just three sessions remaining including today for this month series to end. Looking at the overall picture, the expiry should favour only bulls and bears have been completely trapped for this series. A move to test the year high at 4693 is also in the cards and looks like there will be a test of 4659 levels within 2 days. It is again better to wait and watch today and at the end of the day tomorrow position oneself for a bullish expiry. Two consequtive weekly high close. Will be break 4700 levels soon ?! Now that the close is higher than 4551 and on the weekly charts it is a continuation of the piercing line pattern, the markets look extremely bullish at this stage. Only on a break and close below 4444 levels will bring in a different view. Are we heading much higher before the expiry ?! Yesterday again the markets opened very strong and did sustain till the end of the day and closed almost at day’s high completely breaking all the resistance levels. We are standing very close to the crucial resistance level of 4551 where there was also a powerful bull trap. If that level is breached and NIFTY closes higher than that, as written in earlier posts our view is going to be extremely bullish and we are going to see a much higher move before expiry. Sell off seen yesterday. Will that continue ?! 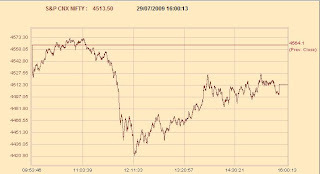 It was a very strong sell off which started much earlier in the day completely trapping bulls above 4550 levels. It now looks like all the conventional patterns are deliberately broken, first a failed head and shoulders pattern around 4000 levels and this time a failed ‘W’ breakout around 4500 levels. 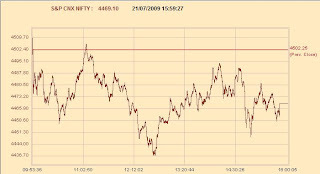 It looks like there will be a move to retest 4260 levels soon if NIFTY is unable to move past 4444 levels. Now that the bull trap at 4550 level is established any move above that will change the view as extremely bullish which is unlikely to happen this week. Yesterday was a clear consolidation and markets are waiting right now before taking the next big move. Most of what was written yesterday still remains the same and if NIFTY has to move up strongly a move to throw away the weak bulls is also not ruled out and a retest of 4412 levels momentarily is anticipated. Two consequtive strong close, but not yet ready for the big up move ?! Yesterday again was a strong trend day and closed almost at day’s high. 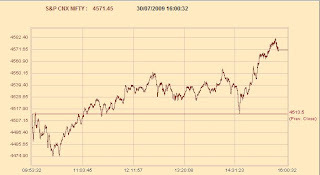 On its way up there have been powerful bear traps made at the level of 4445 and NIFTY managed to close above 4500 levels. 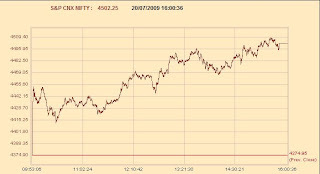 As said earlier, a close above 4275 would push NIFTY to 4475 and the target is reached. Clearly now almost all the neavy weights are geared up for the next up move, so also NIFTY. A breakout of the ‘W’ pattern which is also a bullish indicator. Having seen all this, it is difficult to take a bearish stance now. Now that the run up has been too fast, NIFTY has to cool off a day or two if at all this bull run has to continue, a bearish move atleast to throw the weak bulls out before making the next one. A move either side could be equally justified and so it is prudent to wait for a two or three days to see how this spans out before making any trading calls.